The Milford Sound, one of New Zealand’s most popular sights, is located just a few hours away from Queenstown on the South Island. 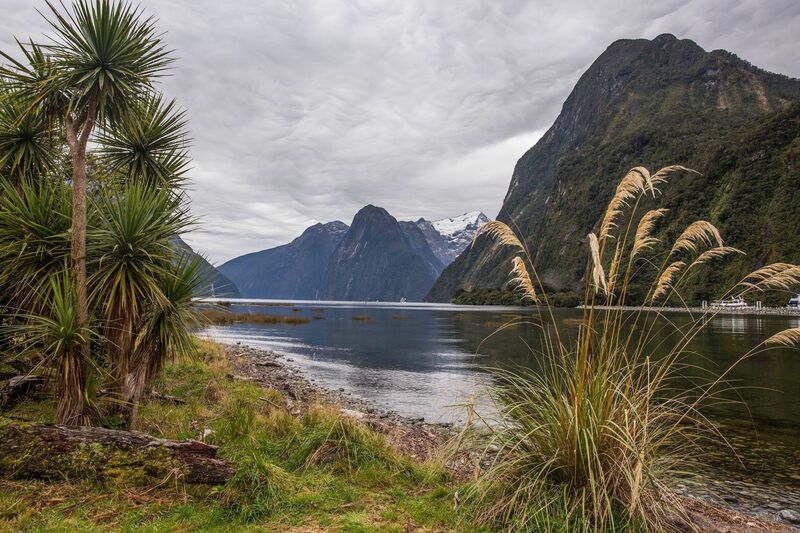 Before arriving in Queenstown, we heard that you cannot visit New Zealand without visiting Milford Sound. It would be like going to Paris and not seeing the Eiffel Tower. After seeing tons of photos on line and hearing all of the hype about Milford Sound, it made the top of our list of things to visit during our New Zealand tour. The Milford Sound can be visited as a day trip from Queenstown, but this makes for a very, very long day. Board a bus for a 4 hour scenic road trip, arrive in the Milford Sound, board a boat for an hour and a half cruise, and then repeat the same four hour ride to get you back to Queenstown. Yes, it is doable, but this did not sound like fun for the four of us. Instead, a trip to the Milford Sound is a perfect day trip from the much closer town of Te Anau. 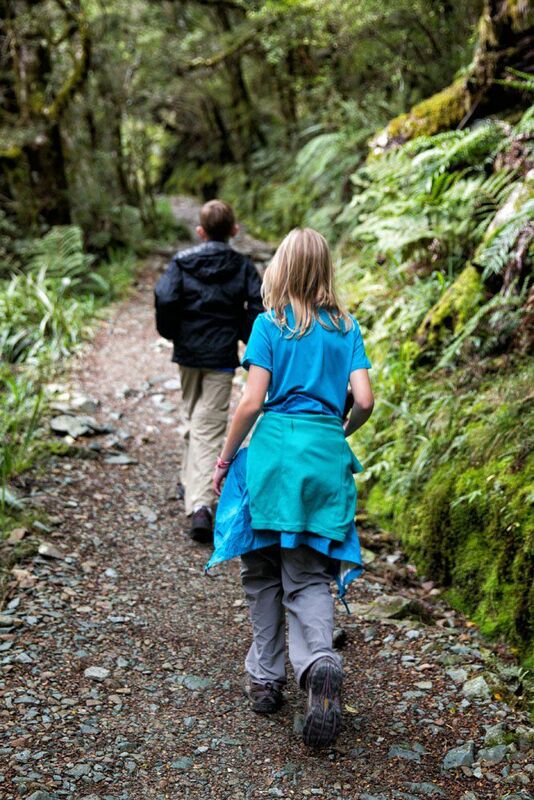 Staying in Te Anau allows for a leisurely two hour ride to the sound with plenty of time for ooohs and aaahs at the various scenic points, more time to explore Milford Sound, and even time enough for a fairly strenuous hike on the way back to Te Anau. The very small town of Te Anau is located two hours south of Queenstown and is also just two hours away from the Milford Sound. This splits the distance between the two destinations, making for much more enjoyable time touring this area. We spent two nights at the Alpenhorn Motel in a one bedroom apartment with a kitchenette, giving us our first chance to prepare basic meals in seven months. Since we were here during the beginning of the off season, we were the only guests at the motel. The day we visited the Milford Sound, we were up and out the door by 8:15 am. This gave us three hours to drive the 120 km to the Milford Sound with plenty of time for photo opportunities along the way. At 11:15 am we had a cruise booked for our tour of the Milford Sound. There are various viewpoints along the way. Our favorites were Mirror Lake, a small, quiet lake with a perfect reflection of the nearby mountains, as well as The Chasm, a twenty minute out and back walk to see water rushing through a gorge which is quite spectacular. Prior to arriving at the Milford Sound we traveled through the Homer Tunnel, a one way, ancient looking tunnel. It was dimly lit and dripping with recent rainwater, quite an interesting experience. We hit the timing of the lights just right, but it can take up to twenty minutes to pass through the tunnel, especially during high season. We arrived at the Milford Sound and had some extra time before our cruise; just enough time to take a quick walk to a scenic point. As we had approached the Milford Sound, our partly sunny skies deteriorated into overcast skies, but the wavy, blanket of clouds added to the drama of the scene. 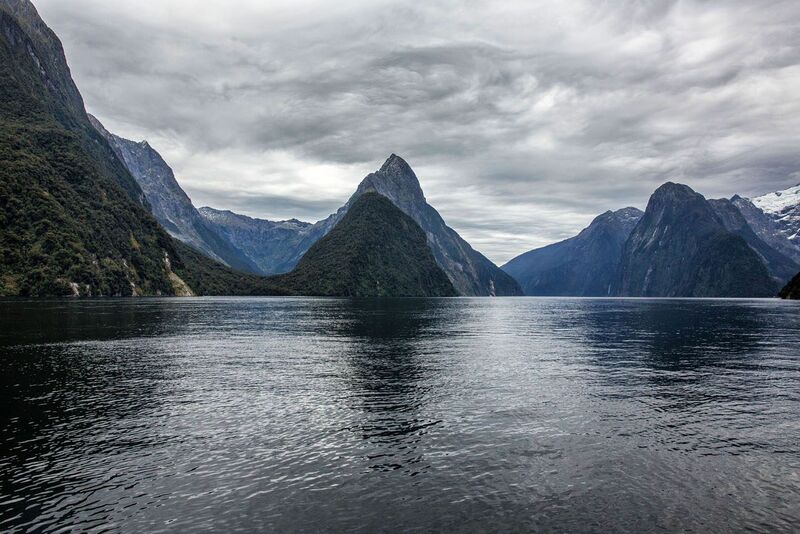 The Milford Sound gets six meters of rain per year, so to not have a rainy day we were quite thankful. There are five or six tour companies offering an hour and a half tour of the Milford Sound, all with nearly identical itineraries. We chose Jucy because they offered the tour at a cheap price. We were seeing all of the same things as the other tours, so why pay more? At 11:15 we were on our way, taking our hour and a half tour of the Milford Sound. To be honest, we all thought the Milford Sound was beautiful and worthwhile to see, but it did not live up the hype we had been hearing about. 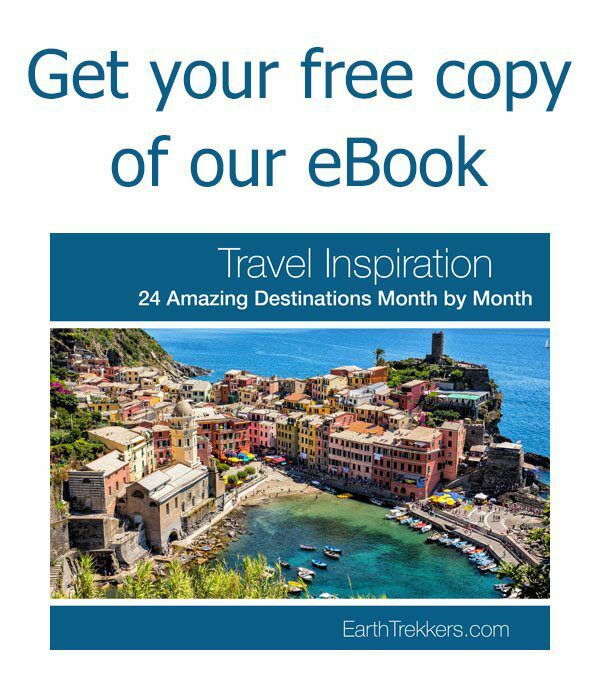 We cruised along a fiord, with tall mountains on either side of us, with waterfalls, native plant life, and even some seals and a quick look at the Tasman Sea, but it was not as amazing as we were expecting. In a lot of ways, it had us reminiscing of our cruise on the fjords in Norway two years ago. These two places look almost identical. Add in chilly, overcast conditions and two bored kids on both visits and we have a good case of déjà vu. After our cruise was over we started our drive back to Te Anau. 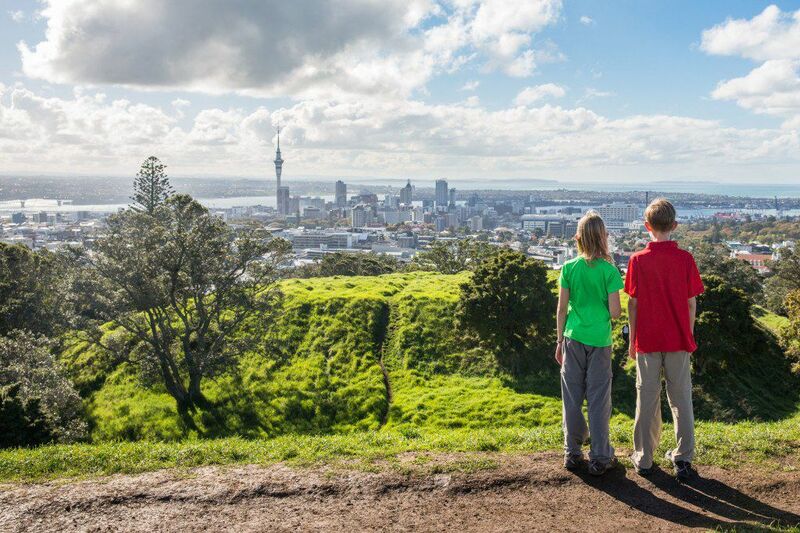 Since we are avid hikers we were anxious to get our hiking shoes dirty in New Zealand. Time to go tramping! Not far past the Homer Tunnel on the way back to Te Anau is the Divide car pack. 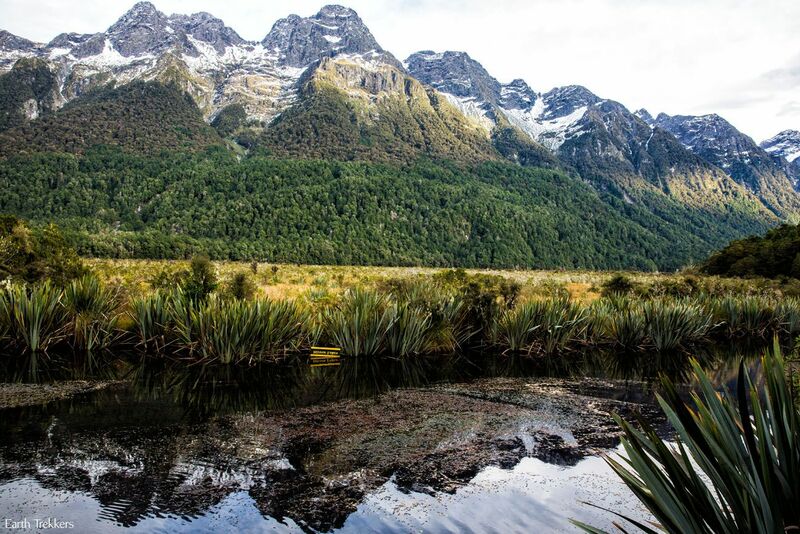 It is here that people can start the world famous Routeburn Track, a multi-day hike that takes trampers through some of New Zealand’s most spectacular scenery. We hiked the Key Summit Hike, a three hour hike that took us on a portion of the Routeburn Track and then higher to a summit point with amazing views of New Zealand. It took us about an hour to get to the summit. 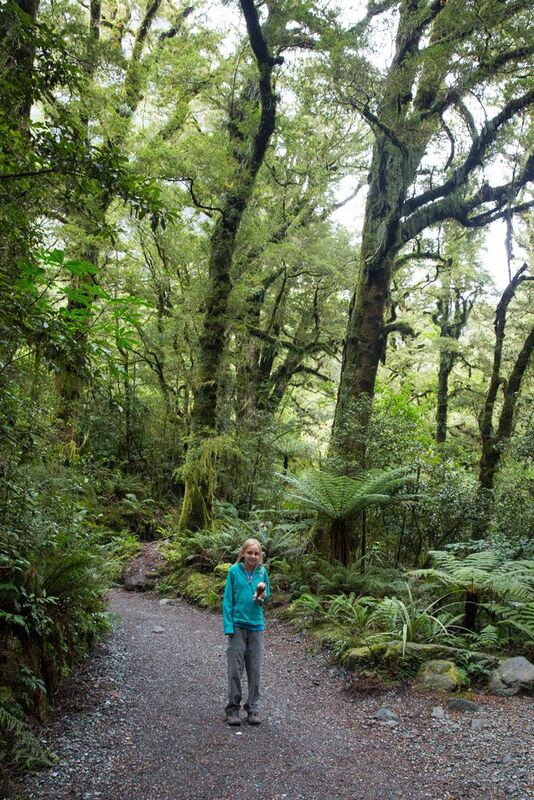 The first portion of the hike took us through New Zealand’s temperate rainforest. Once we got high enough, we entered alpine scenery, with shrubbery and stunning mountain views. It was windy and quite chilly and it didn’t take long until Kara was freezing and cranky. The rest of us enjoyed the views…more amazing New Zealand views. Wow, we love it here! After some photos on the mountaintop, including a couple goofy Earth Trekker photos, we walked back down to our car, completing the entire hike in exactly three hours. For those driving out to the Milford Sound and are looking for a short hike to really get a good view of the scenery in this part of New Zealand, this hike is unbeatable. I highly recommend it. 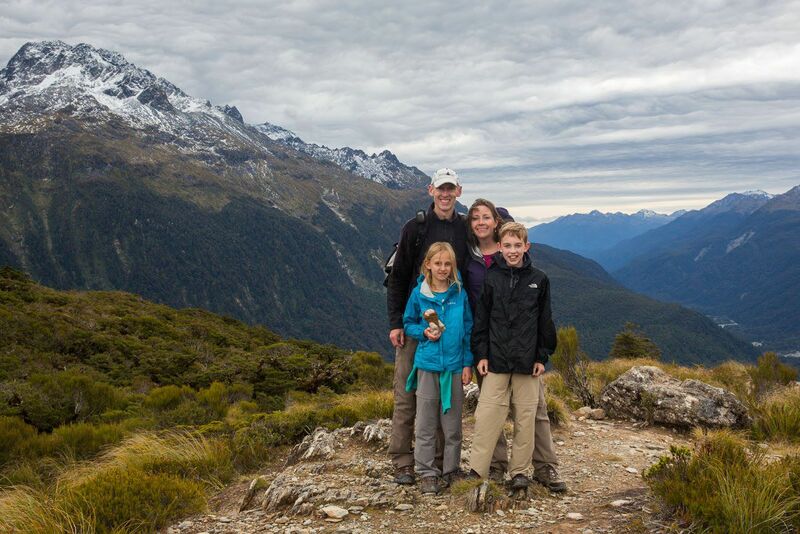 We all enjoyed the views from the Key Summit more than the views from the Milford Sound cruise. Well, maybe except for Kara, who had quite the warm, comfy spot on the cruise and later had hands as cold as ice while we were hiking. 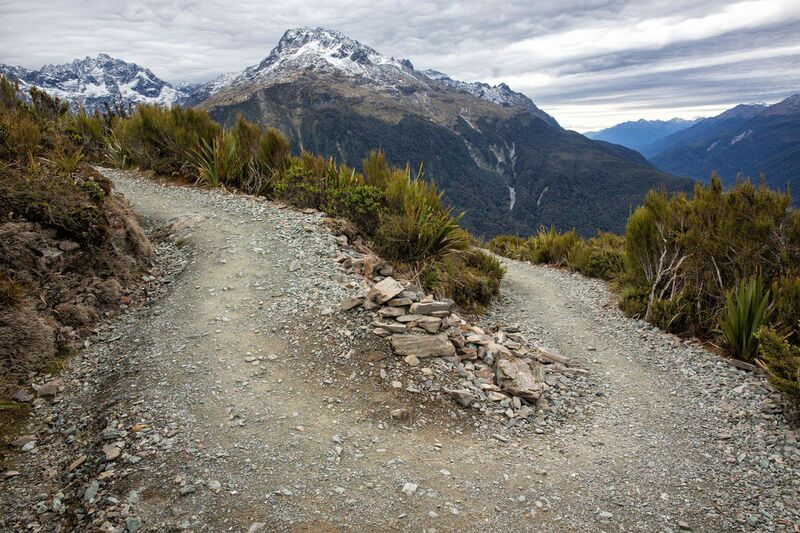 This was our first taste of tramping in New Zealand and we were all eager for more. We reached the town of Te Anau by 6 pm, just in time for another “home cooked” meal while watching a DVD on the TV. What a spectacular day! We stayed at Alpenhorn Motel and loved it here. This place is great for families, with a bedroom for the kids, a kitchenette with microwave and cooktop, and a living area with TV, DVD, and free movies to borrow from the office. It was clean and quiet and conveniently located in Te Anau. 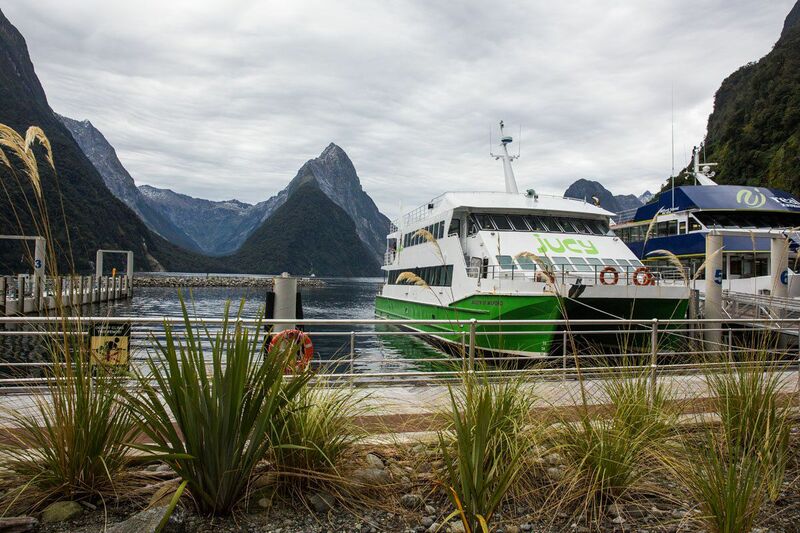 Jucy is the company we used for our Milford Sound cruise. 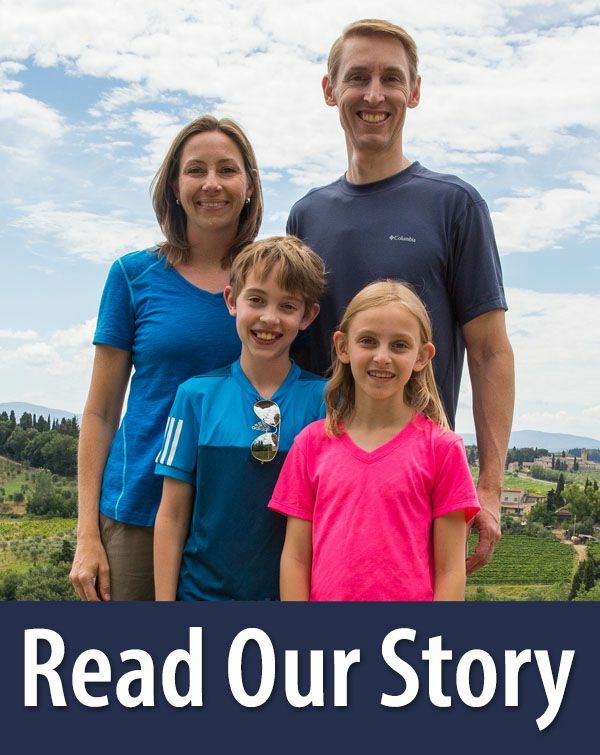 For our family of four in April 2015 we paid $118 NZD ($90 USD). We got an Easter special one kid free deal…so Kara got a free ride on a beanbag, the best seat on the boat! The town of Te Anau has a well stocked grocery store, heaps of small restaurants, and even a Subway restaurant. 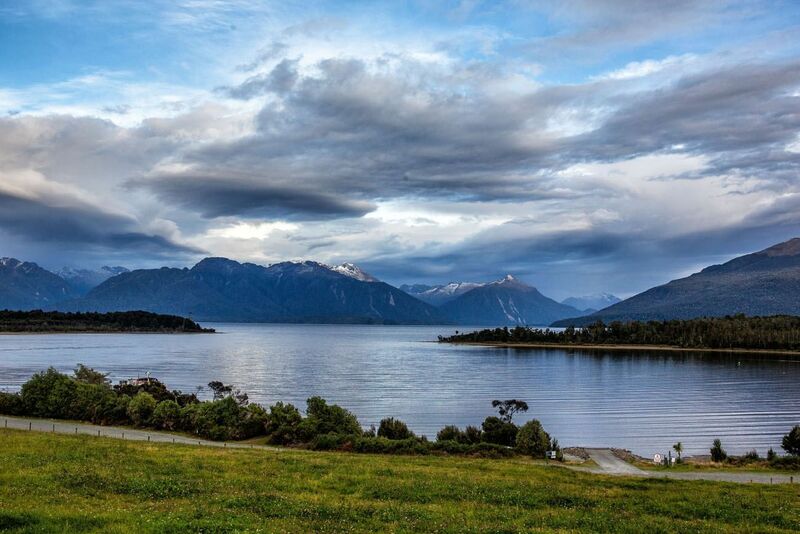 There is a waterfront area in town with great views across the Te Anau Lake. 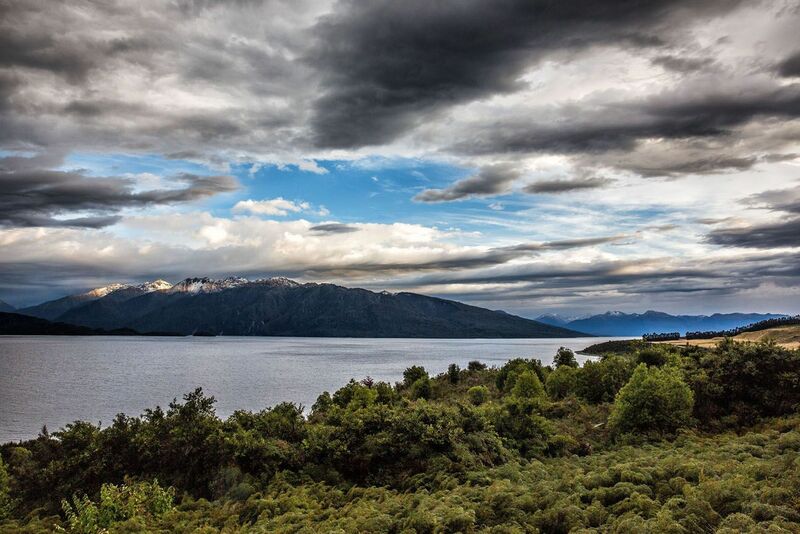 It takes roughly two hours to reach Te Anau from Queenstown, not allowing time for any stops. Our drive took three hours because we stopped for so many photos. I couldn’t help it! Around every turn was another fabulous view! 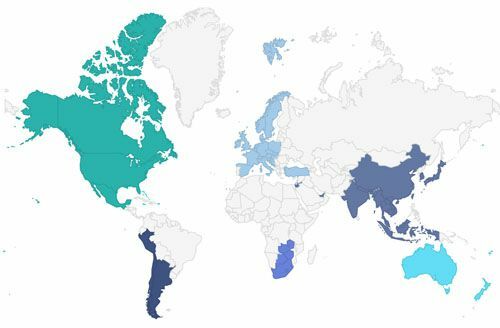 Check out our post: Wow! The drive from Te Anau to the Milford Sound takes about two and half hours, allowing a few very short stops for scenic views and photos. We gave ourselves three hours, stopped at Mirror Lake and The Chasm, and still had a half hour to spare at the Milford Sound before boarding our boat. It was also low season so we did not have to deal with traffic or a long wait at the tunnel. 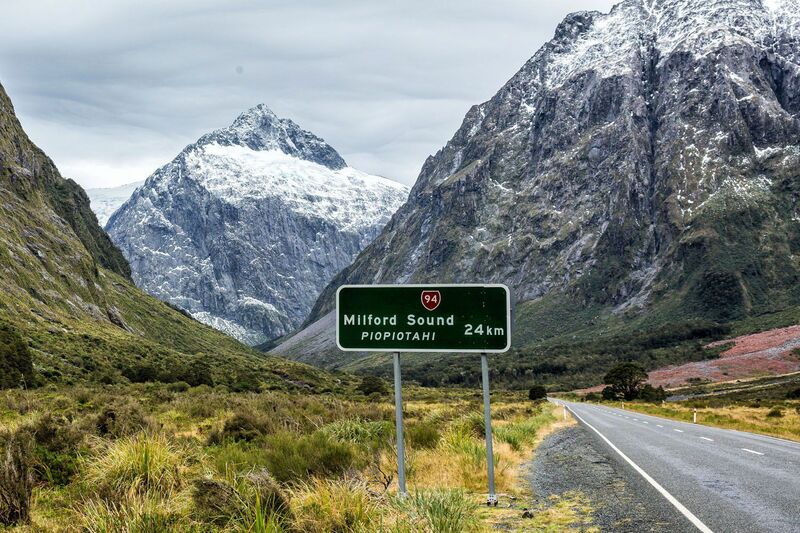 If you are driving from Te Anau, I would give yourself three hours or more, just to make sure you reach the Milford Sound in time for your cruise. The Key Summit hike from the Divide car park is a three hour return hike. It is an easy hike that anyone with average fitness can complete. It is a constant, steady climb up to Key Summit. Rarely is it steep, just be prepared for a steady, uphill walk. It can be a lot colder and windier at the top so make sure that you have plenty of warm clothes, especially during the cooler months. We loved this hike, even Kara and her frozen hands. Thanks for posting this. 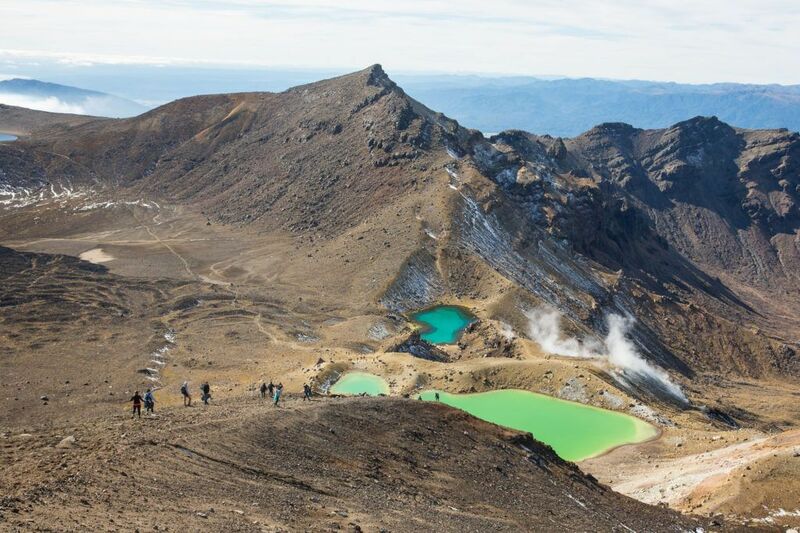 We’re going to NZ in two weeks and I was wondering if it was possible drive from Te Anau, cruise Milford, and still have time to hike Key Summit all in one day. From your blog I see it is and I appreciate that you posted your timetable. We’ll be there in early March so maybe a bit more crowded. In hindsight would you suggest the same timetable or make any changes? did you drive to Milford or take a coach? 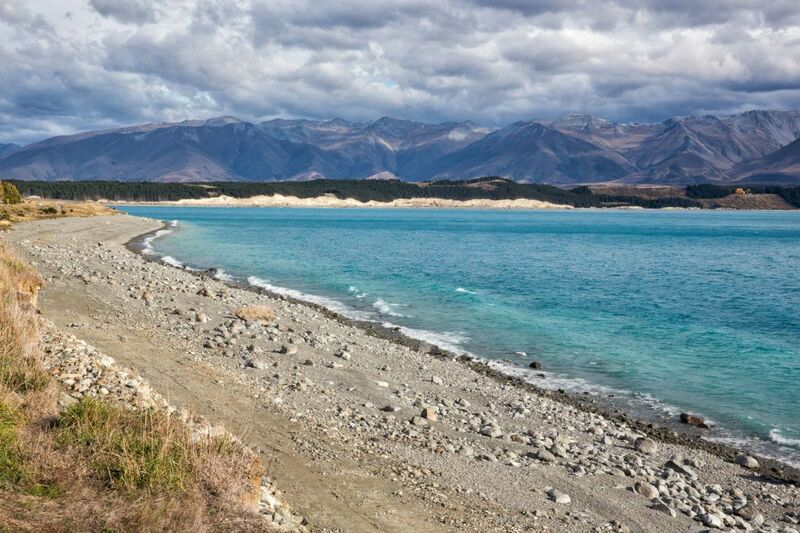 whats the cheapest way to do milford without driving from queenstown? So jealous to see your photo at Mirror Lake! We were there early November and it was raining so we didn’t see mountain reflections on the lake. Bummer! Sorry you missed it! 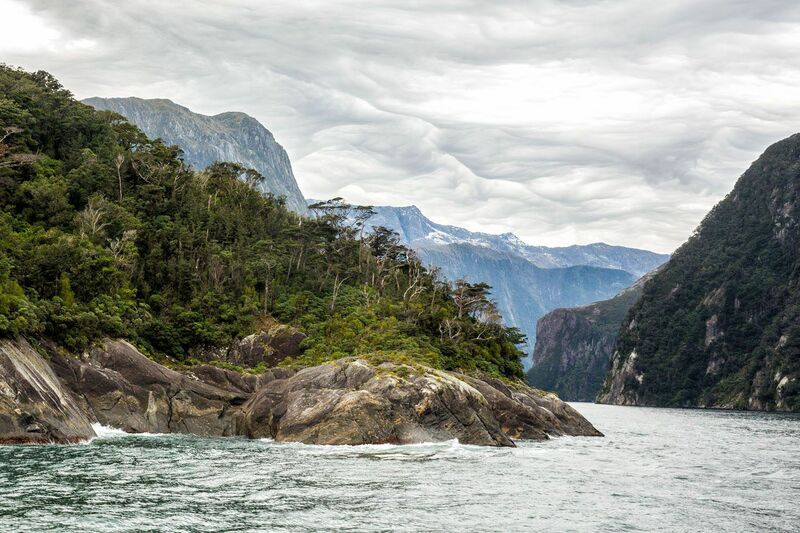 Hopefully the weather cooperated while you were at the Milford Sound. Helpful post. I was reading that the drive from Te Anu to Milford Sound was dangerous but haven’t read anything specific. Would you consider it dangerous? I plan on renting a Toyota Corolla or something similar. Thanks! Hi Julie, did you do the hike in April? If we are visiting in June I believe it will be too cold to do the Key Summit hike? Thank you for sharing. Hi there! 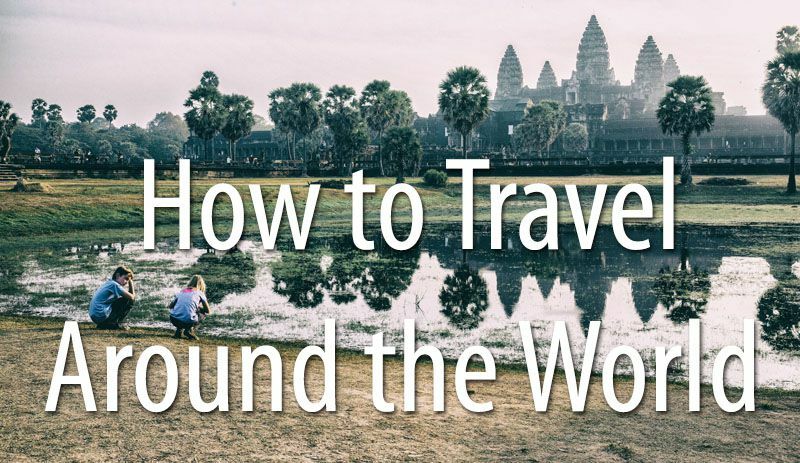 Fellow travel lover/blogger here. I’m debating whether or not to add Milford Sound to my itinerary. Was in Norway last year and did the Geirangerfjord cruise as well as Sognefjord cruise. Was thinking Milford Sound was going to be very similar and wasn’t sure the long haul from Q-town was going to be worth my while. I know you say “it’s like going to Paris and not seeing the Eiffel Tower” but do you think it’s more like “you’ve seen one fjord, you’ve seen them all?” I’m leaning towards going simply because it’s one of those places you must check off the list if you are in the country. Any thoughts?! Thank you! Wow! You certainly seem like an active family. 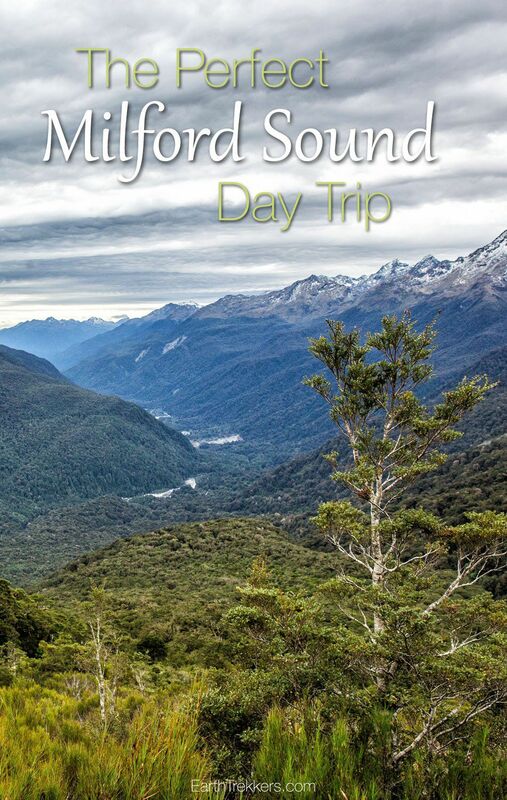 This looks like such an incredible trip, I absolutely loved my time in Milford Sound and the surrounding Fiordland area. 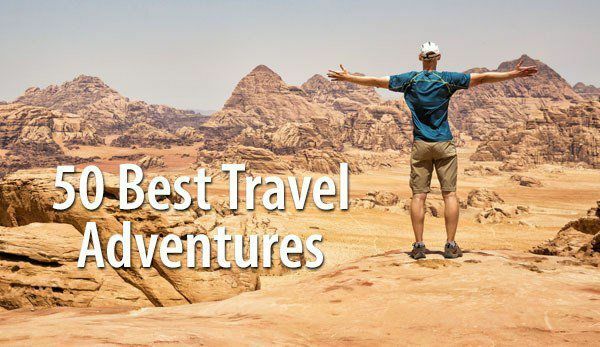 Exploring this phenomenal landscape is a traveller’s dream! I actually took flight over Milford Sound on a scenic helicopter tour and I was awestruck by the immense beauty of this land from above. 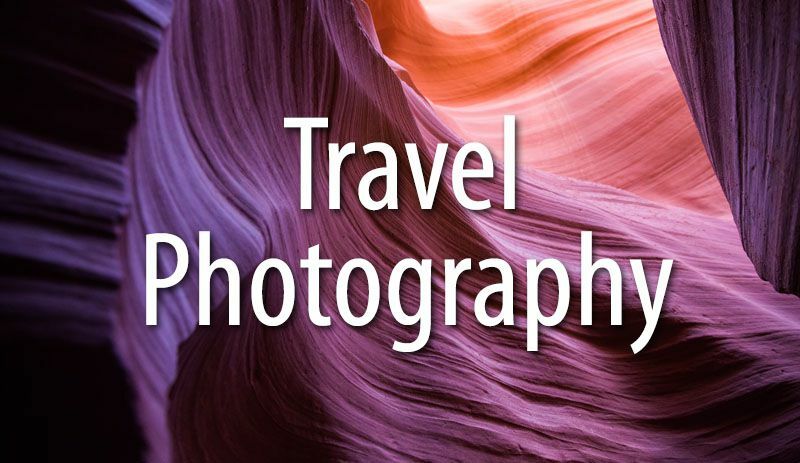 Hi, thanks for sharing your trip to Milford Sound. I am planning to bring my 2 kids there this April (7 and 4 years old). But we will skip Te Anau because we have not much time. I need your opinion here, do you think it is do-able to travel from Queenstown to Milford, and back to Queenstown again in 1 day? We plan to drive ourselves. But I am just wondering…is the long journey really worth the experience? This is a hard one to answer. The drive from Queenstown to the Milford Sound is 4 hours one way. So you are looking at 8 hours of driving to do the Milford Sound as a day trip from Queenstown. The Milford Sound is beautiful and for many people one of the highlights of a visit to New Zealand. For us, we enjoyed it but it didn’t quite live up to the hype. However, the drive between Queenstown and the Milford Sound is filled with amazing scenery, so that makes the trip much more worthwhile. Great post! Very helpful as I was looking for someone who combined Te Anau, Milford Sound, and Queenstown in a short amount of time. 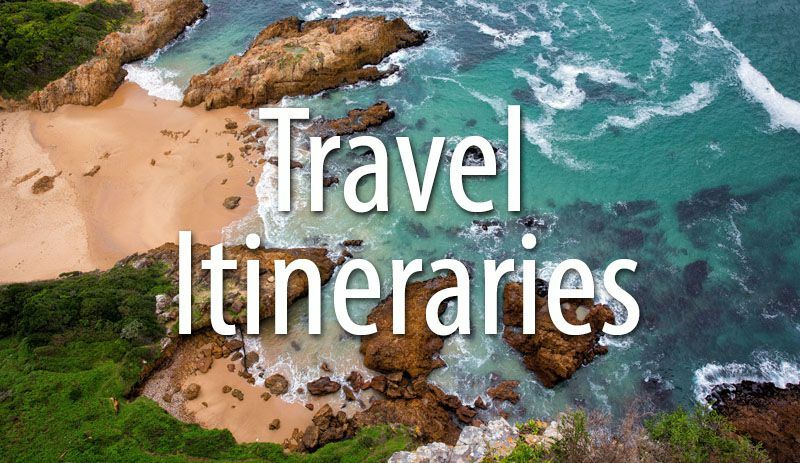 We are planning on just 1 night in Te Anau with the next morning the cruise, Key Summit hike, and then back to Queenstown. Our idea looks doable after your post. Can’t wait just about a month until we visit. Have a great time!! That area of New Zealand is so beautiful. One night in Te Anau is very doable. 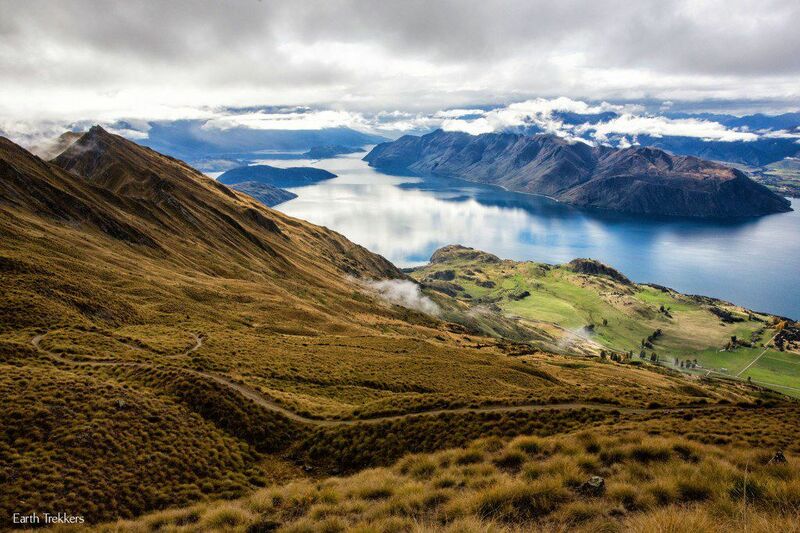 You will get back to Queenstown late in the day but it is worth it to do the Key Summit hike. Just thinking about that day brings back great memories. You are going to have a fabulous time!! Enjoy!